It is one of my oldest high quality headphones , bought ca 2002-3 (thou gh I still not remember the time! ) little later after Greece joined the Euro currency> As far as I can remember , the brother of my wife who was an audiophile and dealer of mid-fi and commercial audio systems and accessories has given ut to me at a price of Eu60 . Considering that very recently have found the prices on the internet being about $20 I can suppose that the importer has earned quite much from their import. 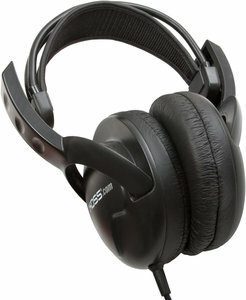 As you may see from the picture these headphones are of full dimension covering fully the ears. That makes them being quite isolating and offering ,by stated many other reviews, quite clear audio. IN several reviews however others say it lacks bass in several others that the bass is enough . The head pairs is pressing the ears mildly. To my opinion in terms of audio, excels regarding to any other earphones already mentioned my my site. Having tested at first one I used the DE929 since 3 years ago I compared them at nearly of the closest to UR20 except: (a) 929 have stronger bass and nearly enhanced 400-800 Hz volume over UR20 (b) UR20 has richer sound and broader spatiality or depth . Quite well isolating foam. Little better isolation to the Sansa and Sparkplug from external noises. Listening it in summer , for quite long , makes me sweat in the points of the headband and near the ears. for those times I prefer to use the Degen 929 ears. Testing with shortwave radio R 75 : forget it ! ICOM’s audio is so shaped that not only the local underground noise but also radio’s audio can irritate my ears with tinnitus in less than 5 minutes . As the Philips mini-headphones with volume control had broken , the use of a very cheap Sennheiser m@h 40 was the best choice. Αναρτήθηκε από Zach Liang στις 12:01 π.μ.